The Vita coaetanea (A Contemporary Life) is an autobiographical account of Ramon Llull´s life dictated by himself to a friend in 1311 when he was seventy-nine years old. In it Llull reviews his works in the context of a life dedicated to God and motivated by the desire to disseminate the message of the Christian faith among the infidels. Llull, the self-labeled troubadour of books, wrote this account in part as a self-justification of his life and work, in part as self-consolation for his unending toils and travails. It is very likely that he also had in mind the Council of Vienne (1311) which he was about to attend and where he submitted petitions dealing with the establishment of adequate places to study languages for the preaching of the Gospel to every creature and the founding of a Christian military religious order that waged permanent war against the Saracens until the Holy Land is reconquered. Llull wanted to frame these petitions within a well thought-out justificatory account of his life and works that exudes passion, commitment and love for his fellow man. “Prof. 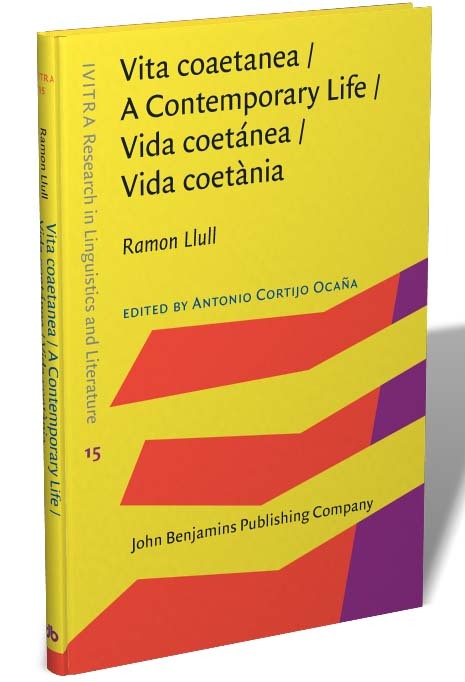 Cortijo’s superb quatrilingual edition of Llull’s Vita coaetanea (in Latin, Catalan, Spanish, and English) brings the contemporary reader closer to the thoughts and actions of one the great forerunners of the Renaissance.” Prof. Pere Villalba i Varneda, Universitat Autònoma de Barcelona, Reial Acadèmia de Bones Lletres de Barcelona. “The Vita is a text of special interest because of the large volume of information that provides us about this philosopher that otherwise would have been lost.” Gabriel Ensenyat Pujol (Universitat de les Illes Balears). “After his magnificent trilingual edition of Llull’s Llibre de l’ordre de cavalleria (John Benjamins, 2015), Prof. Antonio Cortijo Ocaña offers us a superb version of Llull’s Vita coaetanea. In his introductory essay, he deals with numerous aspects related to Llull’s philosophical system and the historical and literary context in which to understand Llull’s vast production.” Prof. Jordi Aladro, University of California, Santa Cruz.